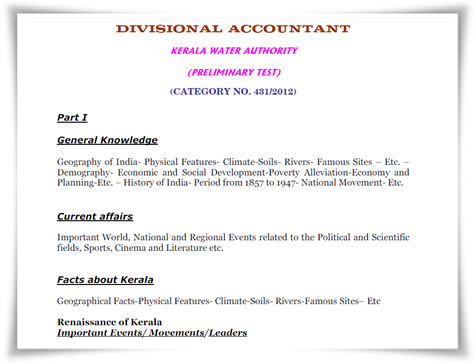 PSC divisional accountant 2014 exam syllabus Kerala water authority is given here. Applicants can download the detailed syllabus of Divisional accountant exam to know the structure of the programme. The PSC divisional accountant 2014 exam is scheduled to be held on 19th June 2014 Saturday from 1:30 PM to 3:15 PM. With 15 vacancies open for the post, applicants should have to try their level best to get into the top slot. The Kerala Public Service Commission has announced the date & time of the Divisional Accountant in Kerala Water authority 2014 exam. The Divisional Accountant exam (Category No: 431/2012) will be held on 19th July (Saturday) 2014 from 01.30 PM to 3.15 PM. For 15 vacancies, 2,89,669 candidates have applied for post. As the number of vacancies is limited, the best performers would get to the top slot. Those who had applied for the exam online can download the admission tickets through their one time registration profile in the website www.keralapsc.gov.in from 28th June 2014. The preliminarily test consists of an objective type exam (OMR Valuation) based on the qualification prescribed for the post. How to prepare for Divisional Accountant exam? As there is no shortcut for success, lot of pain should be taken to get the dream job. The number of candidates appearing for the exam should not bring down the confidence in you. As syllabus is the king, candidates should have to focus on the detailed syllabus and put whole effort to get mastery over the subject. Walk through the detailed syllabus and collect as much previous question papers. Taking online mock tests would build up self confidence and also to gather knowledge about the pattern of questions. It is highly recommended to form study groups which can be utilized to discuss and topics. With less than a month left for the exam, a systematic learning is needed to score high marks and get to the top rank list.